Fr. 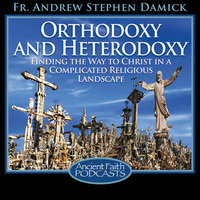 Andrew begins Orthodoxy and Heterodoxy 2.0 with this first revised episode. Why is doctrine and truth so important? In part two of his introduction to the new series, Fr. Andrew goes into the history of the Church and the various heresies it condemned. This is the conclusion of Fr. Andrew's last talk in the four-part series - Foundations of the Orthodox Faith. On this Sunday of the Paralytic, Fr. Andrew speaks about those who have no one to pray for them.